In the picture above is one of our color chess that has painted in white-reddish color. Those chess pieces show different color than ordinary chess pieces which paint in originally white. 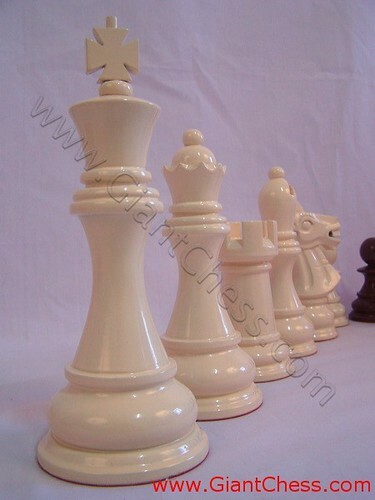 But here we present a new chess color for you and available in big and giant size. This time we try to create different chess piece. Look those wooden chess pieces. Polished in white and add with glossy look. We add the paint with reddish touch. And the result is so unusual chess pieces which perfect also for house decoration. You can decorate your house by put these chess pieces in your living room, library, in the corner of your dinning room or even you can put it at your garden or backyard. This product is very durable for outdoor and indoor. Get it now!